After almost a year of thinking about, sketching, and weaving mock-ups, I have finished the commission awarded me by the Fuller Craft Museum in Brockton, MA. The challenge was to create a basket over and beyond what I had done before, yet exemplify the best of what I am known for. The idea for this basket was inspired by the the linear elements of cultivated fields off-set by the wild outcroppings I saw in a Google map. The current basket has taken the idea of nature's geography one step further, into stylized texture. The chartreuse "field" (in the inner basket) holds the promise of spring growth. I was thinking of wild mustangs, and reindeer left to roam free for the summer. (The Google map was of Montana where I'd read about mustang gatherings and I'd been thinking about walking with reindeer we saw in the mountains in Norway last summer.) 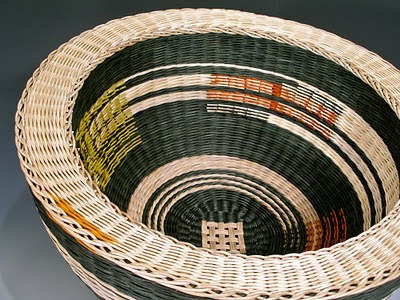 Weaving this basket was a way to honor the animal spirit and natural beauty I love. Well done with the finished commission - it looks marvellous. Thank you for giving an idea of scale - it's smaller than I thought it would be. (Though common sense would have worked it out by the size of rattan...) I couldn't get your link to work but will re visit as this is probably a temporary blip. The link to see process photos has been fixed, thanks for letting me know it was broken! Incredible both in the finished piece and in the documentation of the process. I am in awe of you. That's gorgeous! I love the colors, and the way you worked them into each other. Bravo! Oh what a wonderful work of art - it is sublime and you are a true craftsperson. Thank you for seeking me out: I am grateful to have arrived here and be allowed to look at your work. Can't better the comment from Janice who so beautifully says what I am thinking. I'm amazed--by both the process and the finished basket. That makes "words" seem like a cinch. Kari, I am amazed and will look further! 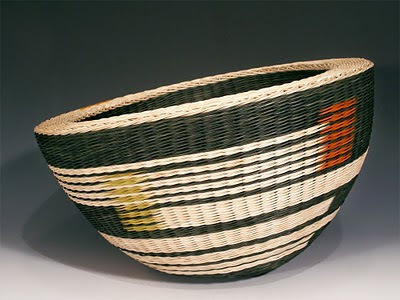 Love your works of art in Basketry! Kari, Very beautiful. Congratulations. Really enjoyed the "in progress" shots too.